A simple recipe for upside down meatball casserole. With less than 15 minutes of prep time, this hearty and satisfying casserole is comfort food at its best. I consider myself a baker. Although I cook almost every day for my family I’m always looking for shortcuts to have dinner ready in less than 30 minutes. But I don’t cut corners on the flavors! Sometimes, during the day I find myself with a few free minutes on my hand and I love doing some of the prep work and store it in the freezer until needed. If I can take everything from the freezer, assemble dinner in 5 minutes or less, you can count me in! And this meatball casserole, well, it’s one of my favorites. It comes together in just a few minutes with ingredients I have already stored in the freezer or refrigerator. When I was a kid, I was the picky eater in my family. No matter what my mom did, she could not make me eat my veggies willingly. I would find a way to eat something else, but not the vegetables. But my mom was tricky. She knew how to hide some veggies without letting us know. Like in her famous meatballs. She always added shredded carrots. And finely chopped parsley. I have the feeling one time she even added some grated zucchini. I had no idea until recently, when I went home a couple of years ago and saw her making meatballs for my niece and nephew, who are picky eaters as well. I guess it runs in the family. What I love about these meatballs? They can be made few days up to 2 weeks in advance. As soon as all the ingredients are mixed together, shape the balls, place them on a cookie sheet topped with parchment paper, quick freeze for 20 minutes and then, place the frozen meatballs in a freezer ziplock bag. Make sure the bag is freezer safe so the meatballs don’t get freezer burns. When you need meatballs, just take them out of the freezer, fry in a little oil and you’re set. No need to thaw! Easy, peasy I’m telling you. You can use the meatballs in casseroles, in subs, with spaghetti or eat them plain with a toss salad. Lots of possibilities. Now, back to the meatball casserole. Once you have your meatballs done, take about 20-25 out of the freezer and fry them in a little bit of oil. Meanwhile heat up the oven. To assemble the casserole, place the cooked meatballs on the bottom of a casserole dish. Pour one jar of your favorite marinara sauce over them. Top with some shredded cheddar cheese (I used Kraft finely shredded triple cheddar cheese) and cover everything with frozen Grands!® Frozen Mini Buttermilk Biscuits sliced in half. Place the casserole in the oven and bake until bubbly and the biscuits are golden brown. You see, it’s that easy!!!! Now of course, if you don’t want to make my mom’s meatballs (you really should, they are the best! ), you can use your favorite meatball recipe. Just make sure the meatballs are about the size of a walnut. It goes without saying, my family loves this meatball casserole. It’s comfort food! In a bowl, add all the ingredients and with a wooden spoon (or ever better with your hands) squish well and combined. Take small pieces of the mixture and shape the balls into desired size. I prefer them the size of a walnut. The recipe yields 50-55 meatballs. Place the meatballs on a cookie sheet topped with parchment paper. Once all the meatballs are shaped, place the cookie sheet in the freezer for 20 minutes or until frozen enough to handle. 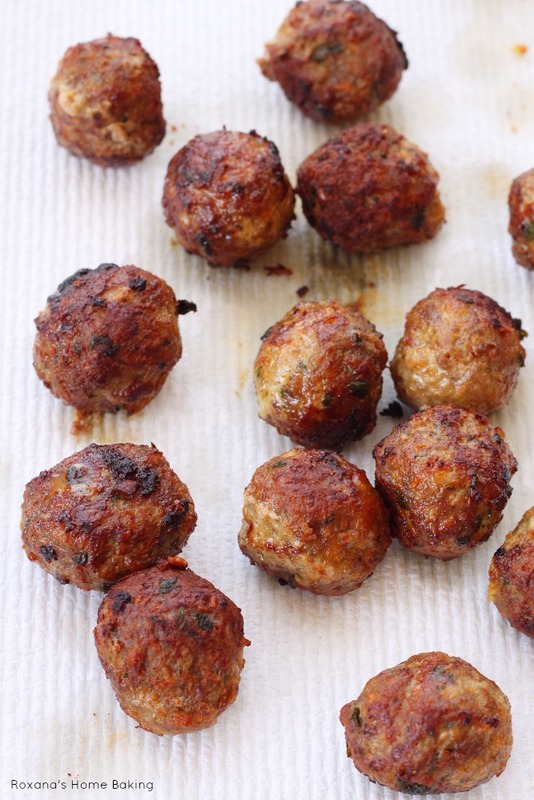 Remove the meatballs from the cookie sheet and place them in a freezer safe ziplock bag. To cook the meatballs, heat about 1/4 cup of oil in a medium large frying pan. Add the meatballs and cook over medium heat for few minutes, tossing the meatballs to brown on all sides. Remove from the saucepan on paper towels. To make the meatball casserole. Place 20-25 fried meatballs in a casserole dish. Pour the marinara sauce over the meatballs. Sprinkle the grated cheese over the marinara sauce. Slice the frozen biscuits in half and top the casserole with them. 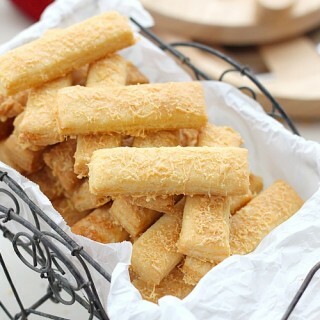 Bake in preheated oven for 30 minutes or until the casserole is bubbly on the edges and the biscuits are golden brown. Serve warm with more grated cheese on top. Your meatballs looks like heaven! 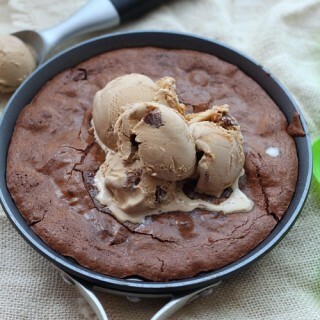 This looks like some serious comfort food!!! Sounds wonderful! I'm the same way--I get very lazy and uninspired when it comes to cooking sometimes!! But this is such a genius idea-it looks like such a delicious comforting dinner, and so simple! What a fantastic idea! This looks great!! This looks like a great dinner. I always use shredded carrots in my meatballs. People think I am crazy. Love that you grew up with that too. I think you could add zucchini or spinach to the meatballs too. Roxana, Can this recipe also work if I cook the meatballs before I freeze them? Hi Alysan, Of course it will. I don't see why not. This looks absolutely wonderful again! I love a good quick meal! This looks fabulous. Pinned. 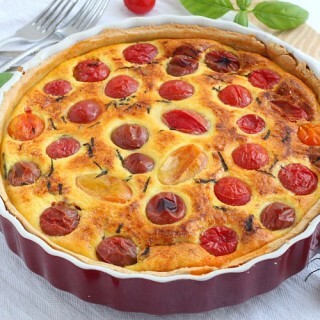 I love seeing savory recipes from you, Roxana! 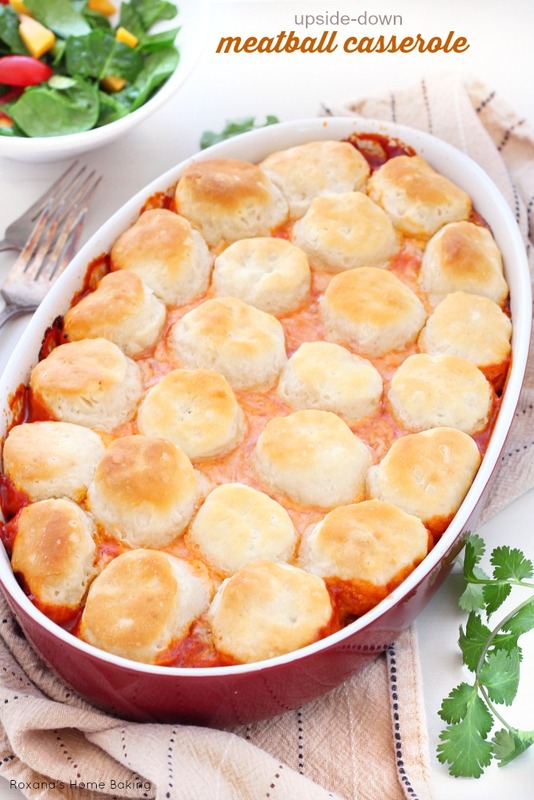 This meatball casserole looks like pure comfort! Lovely meal. 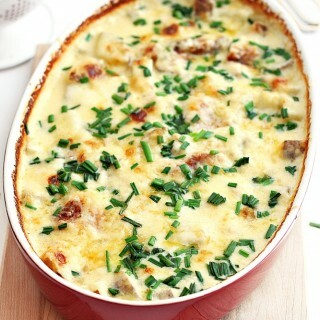 This meatball casserole looks so yummy :) Wish I had some now. I would love for you to share this on my Friday T.G.I.F. linky party :) Have a great weekend!! This may seem like a stupid question, but how do you slice the biscuits in half? I am assuming they are in half horizontally so they aren't such a thick layer on top? I don't think I can slice those frozen biscuits in half. . .
Hi Jenny, Yes, you cut the biscuits so they don't form a thick layer on top. It's really not that hard to cut them, with a good sharp knife, but if you think you can't do it, use the canned version, just, remember to cut them in half horizontally. I'll have to give it a try! I much prefer the frozen biscuits to canned. My husband sent me the link to this recipe. 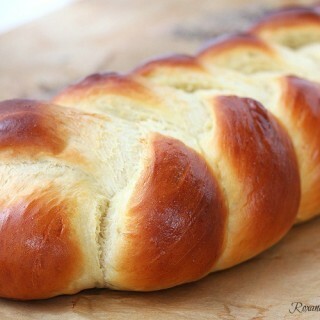 Does anyone agree he is craving this? 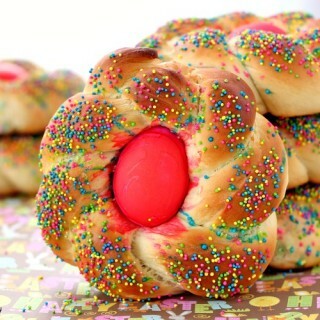 lol It looks delicious! I will definitely try it. This looks so good. Always looking for new things to cook. 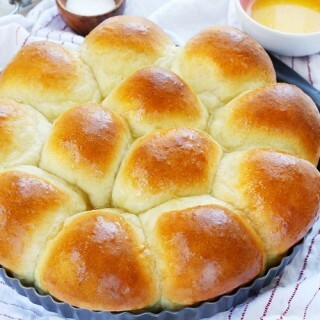 This looks great, im in the uk and we don't have buttermilk biscuits here do you think a dumpling mix would work instead of the biscuits a bit like a cobbler ? 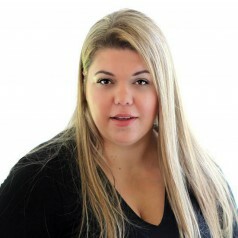 Roxana!!! 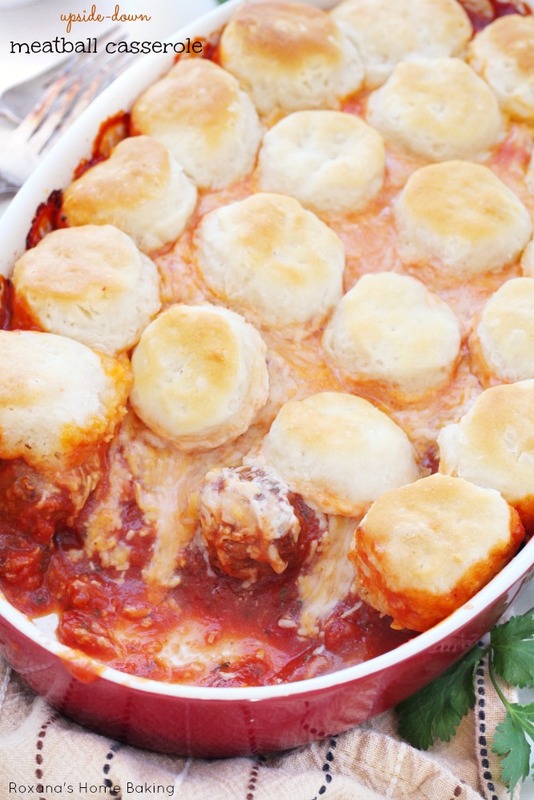 oh my gawd, meatballs in a casserole?!!! I love this!!! Hi Jaclyn, Yes, you can reheat the casserole. For best results, I suggest removing the casserole after 25 minutes. This way, when you reheat it, the biscuits won't burn/over-bake. do you know how long the meatballs stay good in the freezer? We don't have access to the frozen biscuits. It seems they stopped selling them here for some odd reason. Could I substitute Canned Buttermilk Biscuits instead, and would the cook time be less, seeing that they are not frozen? This recipe looks so good, I would love to give it a try. Love Meatballs and what could be better than a Meatball Casserole! Hi Jacqueline, You can use buttermilk biscuits instead and my suggestion would be to cut them in half, since they are a little bigger than the frozen ones. Bake until the biscuits are done. Probably few minutes more. Hi, thank you for posting this! This just became dinner today! Although, i overestimated the time it would take me to make, so i have to re-heat it in 4-5 hours ;) I had to make those buttermilk biscuits from bottom, since we don't have anything remotely close to it here. They were good though! 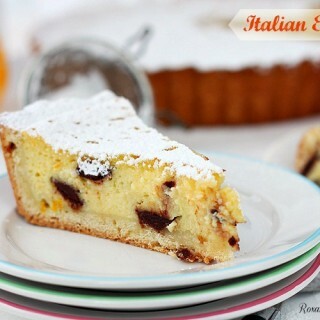 Hi Susanne, So happy to hear you made this cassserole! And making the biscuits from scratch! Way to go! Hi Lissette, You only need to freeze the meatballs before frying them, so they hold their shape. Once fried, you can make the casserole. No need to freeze them again. So yeah, this looks like a really good idea all the way around. Yum! Could you use the frozen meatballs that you find in the frozen foods at the grocery store?